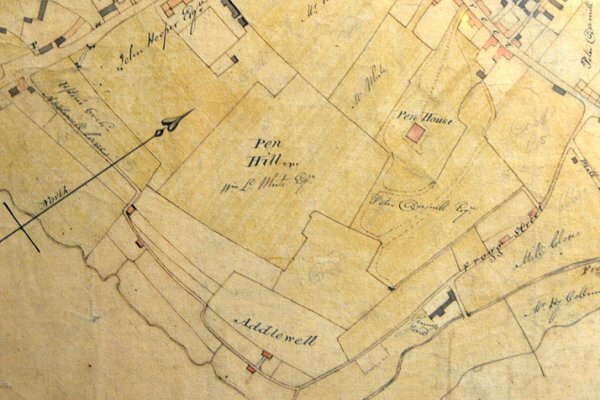 Addlewell appears on Watt’s map of 1806 at a position today that would be roughly south of Park Street halfway between the Swan Theatre and Penn Hill. It is not clear if Addlewell, as shown on this map, was a farm, a house, a locality, or possibly just a large field. It will be seen that at this time neither Park Street nor Penn Hill had been laid out, although the latter is shown as the tree-lined driveway to Penn House. Addlewell Lane was presumably named because it led to Addlewell and not vice versa. E Watts' map of 1806 showing Addlewell Lane joining Hendford at top left and South Street at top right. At bottom centre is the area called Addlewell - just two buildings.